Dylan Fraychineaud: Iona has won the MAAC tournament an impressive four-straight years, but they stand no chance against the Tar Heels. Harris Ahmadzai: I have a soft spot for the Gaels of Iona. A team that routinely ranks among the top NCAA teams in points per game and three-point shooting every year, Iona has built an identity around a high-octane offense. Unfortunately, lightning isn’t striking twice in two years. UNC handles business. Jason Fray; This should be a ho-hum victory for North Carolina. The Tar Heels are far too deep and talented for an upset here. They have the look of a team that may cut down the nets in April. DF- This is one of the more interesting games of the opening round. Washington rolled through the Pac-12 regular season, but got trounced by Oregon in its last game, Matisse Thybulle is an exciting player and potentially great defender for the Huskies, but Utah State’s passing and versatility on the wing will be too much. HA- I’ve been mostly lukewarm on the Pac-12 all year long. A conference filled with talented guys who will eventually play significant minutes for NBA teams shouldn’t be this bad. Washington looked like a lock to sweep the conference tourney, until they put up a dud against Oregon in the championship round. Utah State has beaten Nevada and UC Irvine, and are winners of 17 of their last 18. 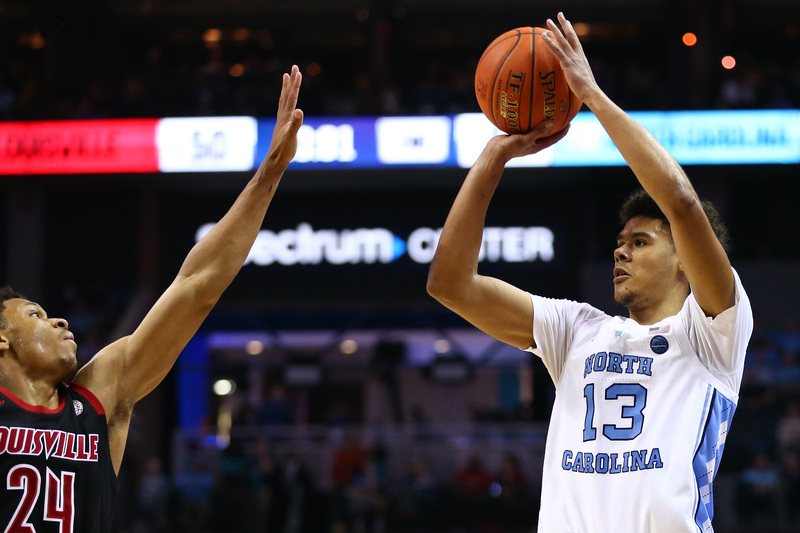 The Aggies could pose a serious threat to UNC if they are able to get through. JF: Utah State comes into this game having won 17 of its last 18 games. The Aggies are an explosive team offensively, and one which has defeated a number of tournament teams already this season (UC Irvine, Nevada). Washington has been up-and-down as of late, and look ready to bow out for the offseason. (5) Auburn vs. (12) New Mexico St.
DF: I’m tempted to go with the upset in this game. New Mexico St. has won 19 games in a row and looked impressive in the process. They are tough to score on (26th in points allowed) and score nearly 80 per game. That being said, Auburn is just a little too good. It’s going to be a struggle, but Auburn will advance. HA- Auburn lives and dies by the three, and they were flying high in the SEC Tournament. They boast six shooters who can all knock down long-range jumpers at a near 40 percent clip. 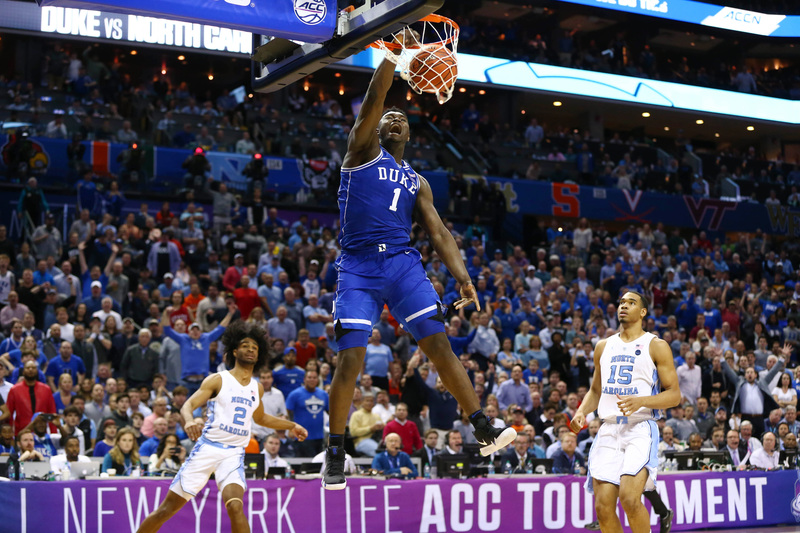 While it fueled them to upsets over Florida and Tennessee, the games begin slowing down as we progress further into March. Arms lock up, and shots seems to come up short more often than not. New Mexico State has an outrageously deep rotation (13 players average at least 10 minutes per game) and they haven’t lost since January 3rd. The Aggies keep it going in a monumental upset over Bruce Pearl’s Tigers. JF: If New Mexico State shot the ball better from three (.335), I’d be more inclined on picking the upset. The Aggies have won 19 in a row — which is certainly nothing to scoff at. 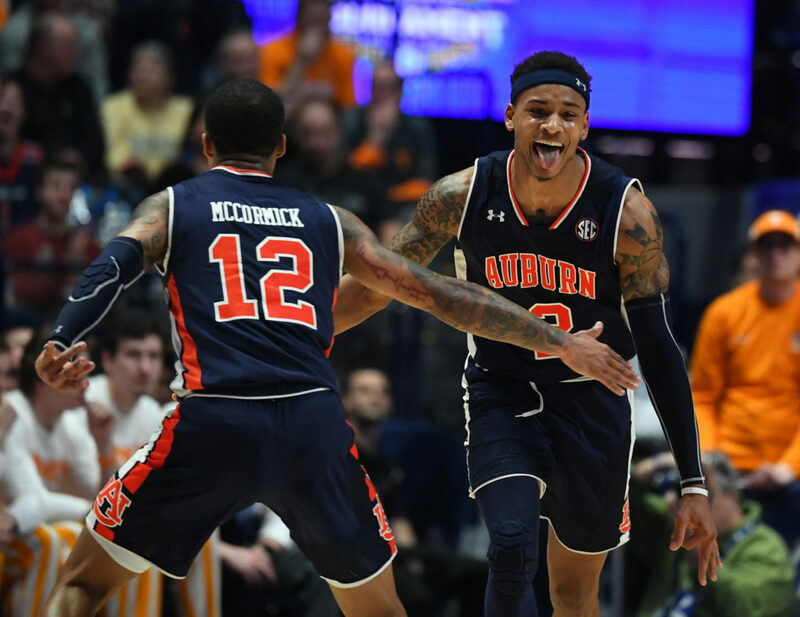 However, Auburn is peaking at the right time, and figure to overwhelm New Mexico State with heavy doses of athleticism and three-pointers. DF: Perhaps the worst Kansas team of the Bill Self era, the Jayhawks mustn’t overlook Northeastern. The Huskies’ backcourt is dynamic and the offense as a whole is dangerous. A team that shoots a ton of threes, Northeastern can smell an upset. Kansas will be shocked. HA- Northeastern has all the makings of a traditional ‘giant killer’. They can knock down threes at at high clip, and have a go-to scorer who can create his own shot in guard Vasa Pusica. However, their resume against Power 5 teams wasn’t overly impressive. Although they beat Alabama back in November, the Huskies didn’t put up much of a fight against Virginia Tech or Syracuse. Kansas is vulnerable, but I believe Bill Self can navigate through a few rounds with a flawed team. JF: Kansas hasn’t looked great all season long. Bill Self’s team has uncharacteristically been plagued by inconsistency on both ends of the floor. With that said, KU should be able to (at the very least) advance to the Round of 32. (6) Iowa St. vs. (11) Ohio St.
DF- Led by Virginia transfer Marial Shayok, the Cyclones will be too much for Ohio State. The Buckeyes should be able to score on Iowa State, but the Cyclones offense will just be too much. Ohio State won’t be able to keep up. HA- Iowa State and wing Marial Shayok are one of the most entertaining teams in college basketball. The Cyclones have some good history in March (two Sweet 16 appearances since 2014), and play the type of up-tempo style which can cause problems in a tournament setting. Ohio State just isn’t very good. They’re in a severe talent drought, and continue to have winning seasons due to the brilliance of coach Chris Holtmann. JF: Iowa State enters the tournament with a ton of momentum. The Cyclones looked quite good in the Big 12 tournament by dispatching of foes Kansas, Baylor, and Kansas State. Ohio State has been rather average all year long. Duly, the Buckeyes don’t really have that one player capable of winning them a game. As such, ISU will advance. (3) Houston vs. (14) Georgia St.
DF- Don’t expect any surprise victories from Georgia State this time around. Houston is a very, very good team. Corey Davis Jr. and Armoni Brooks will lead the Cougars to an easy win. HA- R.J. Hunter isn’t walking through that door. The Panthers have had their ‘Tournament Moment’ once before, and Houston is ready to capture one of their own. JF: Houston is one of the most explosive teams in the field. Though Kelvin Sampson’s team was upset in its conference title game by Cincinnati, this is still a team that won 31 games (out of 34) in the regular season. 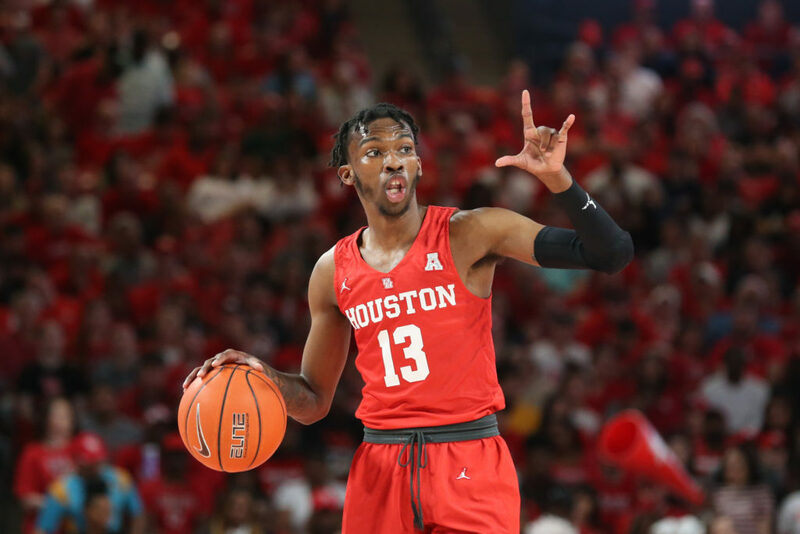 Houston is above-average offensively, and is very good on the defensive end of the floor. It will advance no problem — setting up a tasty second-round tilt with Iowa State. DF- Wofford may be the higher seed, but Seton Hall will enter this game as the favorite. The Pirates will try to bully Wofford inside offensively, but they will have a tough time slowing down Wofford’s shooters. Look for Fletcher Magee and Storm Murphy to sneak the Terriers past Seton Hall on a combined nine three-pointers. HA- Myles Powell is a serious player in this year’s tournament. Seton Hall’s lead guard is putting up just under 23 points per night and is knocking down 3.1 threes per game at a 36.3 percent clip. He could power the Pirates through a couple of games, but the Terriers are no joke. Wofford is the best three-point shooting team in the tournament with the best three-point shooter in the tournament, Fletcher Magee. JF: This should be a fairly close game. Here, we’ve got the classic case of a smaller, less-athletic mid-major versus a longer, bouncier bunch hailing from a major conference. Wofford has won 20 games in a row, and shoots a combined .416 percent from three. This will enable the Terriers to upend Seton Hall en route to a matchup with Kentucky. DF- Abilene’s first ever NCAA Tournament game will not end well. HA- The size and athleticism of Kentucky is too much for a 15-seed. The Wildcats march forward. JF: As is the case with many of the mid-major opponents it plays, Kentucky will overwhelm Abilene Christian with droves of depth and athleticism.